Explain to the children that a rainbow is an arch of colours (red, orange, yellow, green, blue, indigo and violet), which appears in the sky when the sun’s rays reflect falling rain. Create a large 3D rainbow arching over one corner of your setting. Bend strips of corrugated cardboard in rainbow colours, and staple them to adjacent walls. Place a crock of gold at the end of the rainbow – gold chocolate coins in a drawstring pouch or box would be perfect! 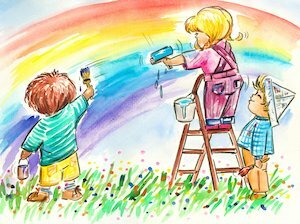 Provide a selection of rainbow-themed books, as well as some rainbow-coloured items for dressing up, and colouring materials for the children to create their own rainbows. See this resource for more interactive display ideas. Furnish the area with rainbow-coloured accessories.